Move over piano, there’s a new instrument in town. Monday the 14th (of January) was my son’s 11th birthday. I am still in total denial that my adorable little toddler is now 11. He starts 6th grade next year and will get to pick an elective, which he has decided will be Band. He really wants to follow in his daddy’s footsteps and be in the marching band in high school (I was in choir). Right now he plays the piano, but his dream is to play the drums and be a part of the drumline in the marching band. You can’t really be in the drumline unless you know how to play the drums, so we bought him a drum kit for his birthday. 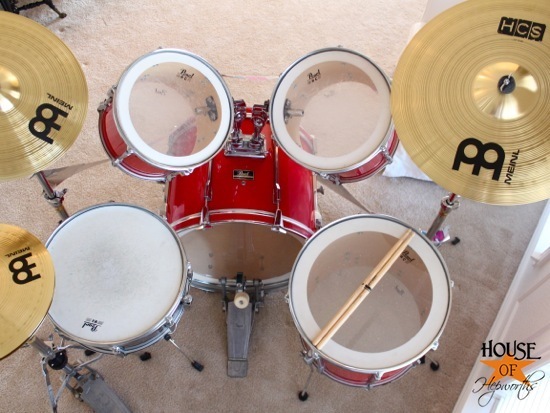 We browsed Craigslist for weeks looking for the perfect drum kit that was cheap enough for us to afford. We totally lucked out and found this red Pearl kit. It was missing some hardware and all the cymbals, so we had to order a few parts and purchase some cymbals at the local music store. 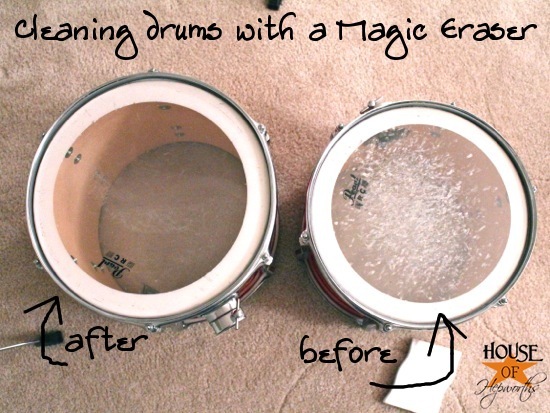 The drums are in great condition but they were dusty from sitting in someone’s garage. They also had a lot of marks on top. I cleaned them with some Shaklee spray cleaner and a soft rag. I also took a Magic Eraser to the tops of them to see if I could get all those marks off. I was a little nervous, but if I ended up ruining one, the tops of the drums can be replaced and are not too expensive, so I just went for it. That Magic Eraser can seriously clean anything. Check out the before and after! As for our son’s reaction? He couldn’t have been any happer if he tried. He was literally completely speechless. He dinked around on the kit for about 15 minutes before school and then pretty much played on it the entire afternoon. This kid has some serious rhythm. He has never played on drums in his life, and within only a few minutes he was banging out a real drum beat. Now I’m the one that’s speechless. It really helped that he already plays the piano. 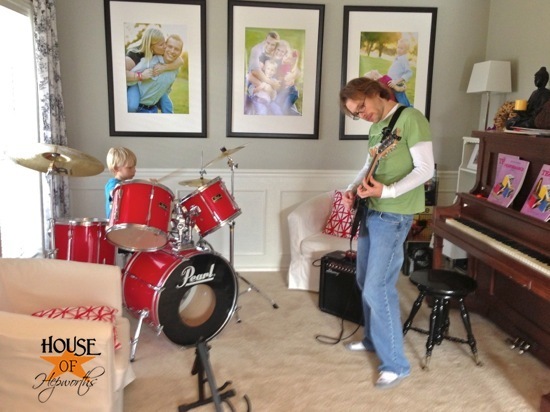 Of course, Ben busted out his ge-tar and the two of them had their very first jam session. They were playing a Weezer song (Beverly Hills), and then they started working on a Victoria Justice song (Make it Shine). Here’s a quick video montage of our son opening his gift, his adorable reaction, and a little jam session showing how quickly he has already picked up playing the drums. And here’s a video that I uploaded two months ago of him playing the piano (he can play this song flawless now. I should make a newer recording). He’s playing the official piano version of Video Killed the Radio Star as played by the Buggles keyboardist Geoff Downes. Ben is in a band and they wanted to cover this song, so Ben actually purchased the official keyboard lesson from Geoff Downes. Once Ben had it mastered he taught it to our son. So ya, we now have a drum kit in our front living room aka the piano room. Sometimes your kids passions trump your decor. 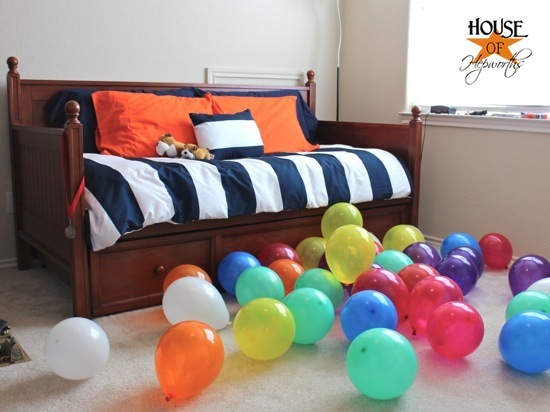 And on a similar note, one fun thing we do each year for both kids is to fill their room with balloons while they are sleeping so when they wake up they have to walk through a sea of balloons. They love this tradition! We didn’t do as many balloons this year because we ran out of time after setting up the drum kit all night. But he did get about 40 balloons and he was happy. Happy 11th birthday, my little man. This kid makes me happier than a bird with a french fry. Oh my… his reaction in the video is priceless!!! Good for you guys for encouraging him to play musical instruments. I always wanted to play the piano as a kid but my mom refused! lol. How fun! I’m guessing that right now he thinks you are the greatest mom in the world! Love the cute video! Oh man, you have me all teary-eyed over here. Watching his reaction and seeing him enjoying his new drum set really made my heart happy. How awesome that he plays the piano too!! Drums! You are such a great mom :). Happy birthday to your not so little guy! 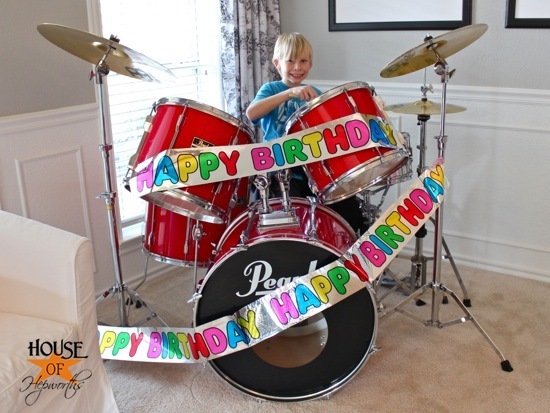 A gift that most parents fear is a dreaded drum set! I love the tradition of balloons on the floor, that is soooooo cool! I don’t have any children yet, but my husband says whatever we have, they have to play drums and hockey. He argues that bands are always in need of good drummers, so it’s a promising career path. ha. Ok, I don’t want to sound ungrateful or anything, because I love your blog, but my OCD can’t handle it anymore: Which Tuesday the 14th? Today is Tuesday, and it’s the 15th. The 14th in December was a Friday. I can’t stand it…he is so stinking cute! Welcome to my world Allison. My husband is the drummer & I play the piano. While my piano gets 2nd billing in the dining room due to its size and ungiving shape, we’ve tucked my husband’s drum kit in an upstairs bedroom. Bless the neighbors’ hearts, they all dream we’d soundproof a room for them but it just has never been in the budget. Your son looks tickled “red”! A drum kit! Wow! You are one brave mama. Congratulations and Happy Birthday, big guy! I’ve always said that once you learn to read music, you can play anything (provided you aren’t tone deaf and rhythmically challenged 😉 I started with violin, then went to piano, guitar, banjo (yeah I know, but my grandma owned one, so I picked it up one day and started messing with it), but I ended up sticking with voice. I can still pick a tune out on the piano, but I haven’t played in years, same with guitar. My oldest is in his 2nd year of trumpet and I hope he’ll try to learn other instruments as well. What a smile! I played the piano for years, and I really want to take my parents’ piano when we are in a larger house with space for one. I would love for my kids to play! awww… cuteness 🙂 What nice parents! How’d the first lesson go?! 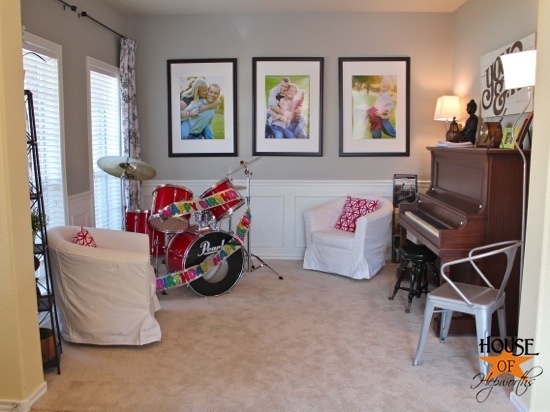 My hubby is a drummer too and when we move next month he will have a whole studio set up in our basement! Drums. guitar, bass and mic! We’re lucky it is concrete walls and the kids sleep on the second floor!! you’re brave to keep it in the living room!!! Coolest. Parents. EVER! 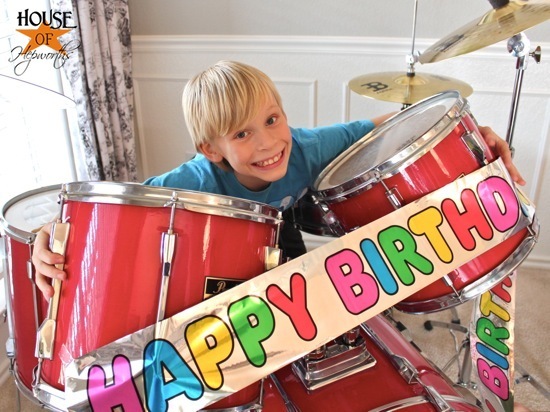 lol Man, why couldn’t my folks have bought me a drum kit when I was 11? AHH that is so cool! I can’t believe you’re all so musically talented!! I would love to see more videos as he gets better! Happy birthday to your son! How very fun! He sounds like he will be a drummer in no time! Love me some Weezer!! Such and awesome present!